Weekend Kits Blog: Easy Felt Christmas Kits - Weekend Projects! Easy Felt Christmas Kits - Weekend Projects! We have a new selection of Bucilla Quick & Easy felt kits for Christmas. They're easy felt applique kits for you to make a felt Christmas stocking or set of felt Christmas ornaments in a weekend! You'll find them in the Seasonal & Holiday Kits section of the store. The Teddy Bear Felt Christmas Stocking Kit is an easy felt applique project with everything you need to make this sweet felt stocking for a special little one. Bucilla Quick & Easy felt kits include stamped felts, cotton floss, sequins, beads, needle, and instructions. Directions for personalizing are also included. The finished stocking size is approx. 15 inches. Quick & Easy felt Christmas kits are perfect for beginner crafters. 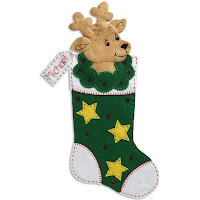 Simple embroidery stitches and minimal embellishments are used to create a classic handmade felt stocking. They also make a fun weekend project for experienced crafters with limited time! Priced lower than more detailed felt kits, they're are also a great value! You get the same high quality materials you expect from all Bucilla products & they're made in the USA! Bucilla felt Christmas stockings stand the test of time. My daughter's Santa Bear Stocking is still going strong after 22 years! I'm currently making the Black Bear Bonfire stocking for my youngest daughter. It's one of the more detailed felt stocking kits from Bucilla, so it will take more than one weekend to complete. 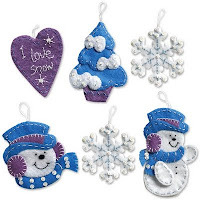 You'll also find Quick & Easy felt Christmas ornament kits in the store! Just like the stocking kits, these felt ornaments are an easy Christmas craft project that can be completed in a weekend. Kit includes all the materials you need to make 6 felt ornaments. The finished size of each ornament is approx. 3-1/2" x 3 1/2". Perfect for decorating the Christmas tree! These creative felt ornaments could also be used to decorate a holiday wreath or to accent holiday gift packages as a special bonus gift! Making felt Christmas ornaments is a fun family or group craft activity. Make up some hot chocolate with marshmallows and turn it into a holiday crafting party! Everyone will enjoy making their ornament while chatting about seasons past and present. Visit the Seasonal & Holiday Kits section for details on these kits and to see our complete selection of Christmas craft kits. Explore a unique variety of creative project kits at Weekend Kits and be ready to create something new for the holidays on your next Weekend at Home! Thanks for visiting the Weekend Kits Blog! Explore our unique selection of Creative Art & Craft Kits for adults, teens & kids. Learn about new product arrivals, helpful resources, and craft kit giveaways! Don't miss our Baby Quilt Kit tutorial series! Stylish & Retro - Apron Patterns for Everyday!